Now that I am back from my Going Caching road trip, I can resume telling the stories about my trip. I was so busy having fun I didn't have time to blog about it while I was there - which, really, is the best way to experience life, don'tcha think?. My mission for this trip was to attend the Mega Event known as Going Caching, which this year was held in Rome Georgia. Along the way I explored parts of Georgia I had never seen before, and got into various adventures and hi-jinxes. So to recap, on Tuesday I drove from my house in western North Carolina to mid Georgia. 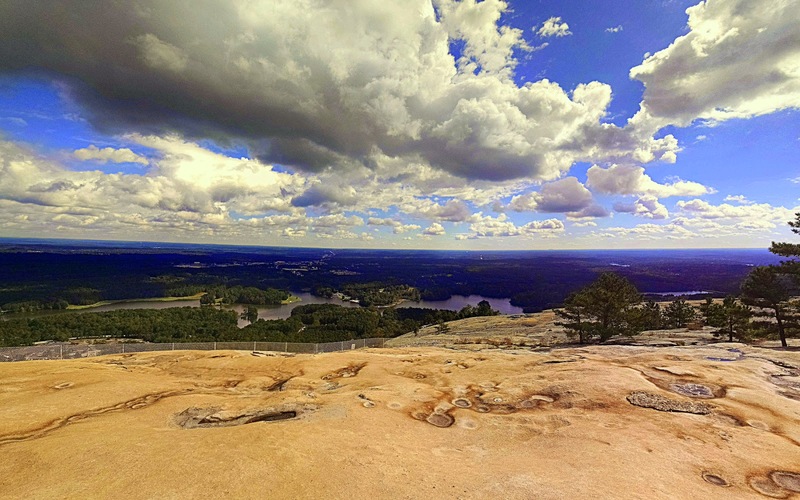 I did some exploring along the way and ended the day strategically placed near my next days adventure: Hiking up Stone Mountain. The top of the rock is quite large, and can be accessed via an areal tram, or by a 1.3 mile long pathway called Walk Up Trail. My mission today was to hike up this trail. As you would expect from something advertised as the largest piece of exposed granite(-ish) in the world, the "trail" was pretty much all stone and rock. Tho, for a large hunk of rock there were a surprisingly large number of trees. I love trees growing into rocks - and this was a whole forrest of it. It pleased me greatly to walk among such hardy survivors. 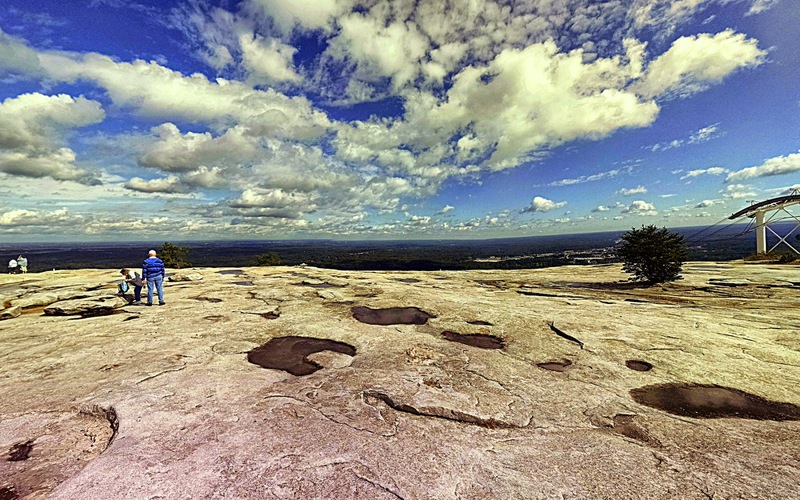 There are a surprisingly large number of caches on Stone Mountain, and even more in the large park that surrounds it. On my hike up the mountain proper, I did 5 virtuals, 3 earth caches, and a handful of regular caches, including one at this old relic of a machine, just off the main path, but definitely not something the vast majority of hikers get to see. I am not entirely sure what this old relic used to be. I had thought some sort of water pump, but it may have also been a generator of some kind. Either way, it is not in use anymore. The last 1500ft or so along the trail is very steep. At places there are railings to give hikers support while working their way up. I took advantage of every extra bit I could get - not so much because of the physical effort, but to help maintain my balance. One nice thing about being on top of a gigantic granite(-ish) dome is that there are very few trees to obstruct your view. This is fortunate, otherwise I'd not get this stunning view of the Atlanta skyline (approx. 10 miles away). Eventually it was time to head down the mountain. I considered all of the options presented to me to exfiltrate myself off the rock, and decided to use the age old geocaching motto "hard way in, easy way out". Yep, I took the tram. Interesting fact I learned along the way. See those puddles in the above photo of the tram? According to the informational signs, there are species of shrimp that live in those puddles. Seems crazy to me, but signs never lie, right? On the way down I got my first view of the largest stone carvings in the world. The carving is a Confederate memorial featuring President Jefferson Davis, "Stonewall" Jackson, and in the middle, Robert E. Lee. The carving takes up an impressive 3 acres of space on the side of the mountain. The space on the back of Lees horse can fit two full size school busses. According to the tour guide lady on the tram the sculpture is taller than Mount Rushmore. The word "impressive" doesn't do it justice. Once I got back down the mountain, I hiked along the edge back to my car. My next stop was Rome Georgia, and the beginning of an amazing geocaching experience known as Going Caching.